Happy September to you all. We are still experiencing a heat wave in the Pacific Northwest so it doesn't yet feel like fall is "right around the corner" but I know it is, and my boots are ready! I even bought some ingredients for a pumpkin spice bundt cake so stay tuned because I'll share the recipe once it cools down enough to turn the oven on again. We've been getting settled into school starting and I've been struggling (as always) to find the family rhythm of routine again. It's been so fun watching my kiddos drive off together, rather than take a school bus. I sure love having them in the same school, and on the same time schedule this year! I've been making it a point to focus on all of the things I have to be thankful for, rather than what is difficult or challenging. I'm working hard to journal my simple thankfuls on Instagram, because those small things can be such a joy if I only have eyes to see them. It's easy to get really bogged down by the daily "must do's" and "what if's" instead of focusing on the good, the blessed, and see the peace in the moment, of the story that's been planned out by the Creator. I keep my simple thankfuls journal, as a way to daily, turn my focus onto the good. Lately, the verse about being weary and heavy laden has swirled in my head and I know that I'm not meant to carry such heavy loads. God promises to give us rest if we give our burdens over. Finding ways to be thankful in all things is a practical way for us to do that....and in return, we get peace and rest. With my kids back in school again, I walked around tweaking and cleaning the other day. It had been a long time since I had incorporated a "currently" post, so this is sort of along those lines. I spent an entire day painting and touching up all of the white in our home... trim, cabinets, doors, etc. That is the reality of living in a white home. It does require upkeep in order to look fresh and clean. I decided it was also time for some new kitchen hardware. I'm slowly replacing knobs and handles and I'll be sharing those with you soon, as that is such an easy way to bring your space up to a more current feeling. In my office, early bits of fall are appearing, with this jar of pheasant feathers. It was so pretty and simple, I wanted to share this as one of my current loves. The jar was from Ikea several years ago, but I'm pretty sure they still carry them. The feathers came from Michael's also years ago, but they always have them as well. We are currently loving this football schedule and it's a really good idea if you've got some fans in your home! (The chalk door was getting so banged up that it needed a repaint, and I decided to go back to all white, rather than another coat of chalk paint.) I love these small rolls of masking paper from Sherwin Williams (about $3-5) because they come in different widths and are perfect for hanging. I strung mine with a strip of cream leather on a command hook and used a chalk pencil for the schedule. My boys really love it and keep track of wins and losses on it. I love it because it's pretty. Truth. I'm a little bit obsessed with this entire corner. The corn husk wreath gets all the heart eyes from me. I honestly think I may find a place to keep it up year round, but would that be weird? It is a corn husk wreath... might get all dusty. Anyway. I made it after seeing it on Martha Stewart's site. You can search for the diy on her site but it's not very instructional. All I can tell you is that it's such an inexpensive craft. The straw wreath form was $3. The corn husk packages were about $2/ea and I grabbed two from the Mexican food aisle at the grocery store and had tons left. I already had a spray bottle of water, glue gun and straight pins. It took about two hours to make, and was definitely trial and error until I got going, then I had it figured out and it went like clock work. It's mostly about spraying and shaping, pinning, and then gluing when dry. And then cleaning up massive mess once done. Ha! Now this is a diy that isn't actually a diy but I'll give you the general idea on how to make these yourself. It's my current obsession. 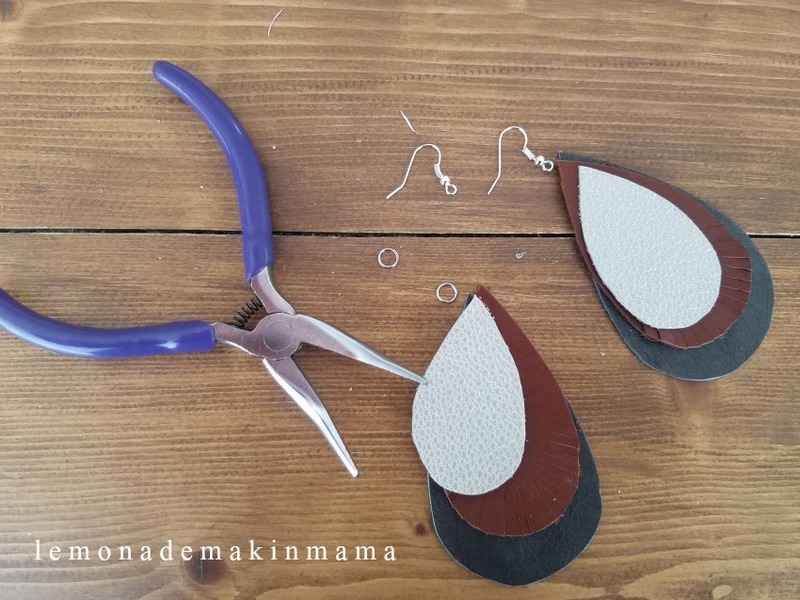 Leather earrings. Joann's sells scrap leather packs and these three actually came together. I loved the combos of gray, redish leather and a textured sparkly pale shade. I purchased earring hooks (no idea what they are called) and jump rings and cut out tear drop shapes in varying sizes. You'll want to create a template on paper first for all three sizes, then trace and cut out with sharp scissors. (Tip, if you fold the paper in half, you get a symmetrical shape.) I used a large needle to make holes for the jump rings at the tops, closed the jump rings over the earring hooks. 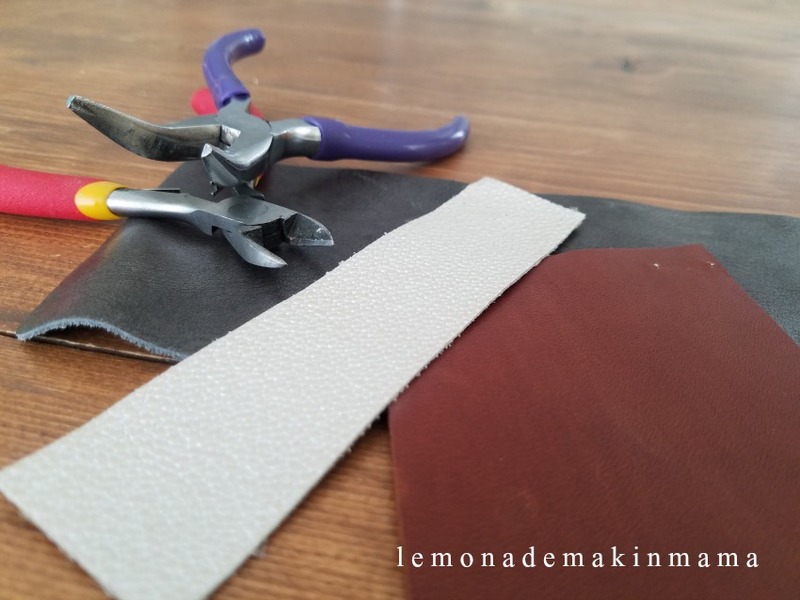 After that, I cut a fringe around the bottoms of each leather drop to finish them off. 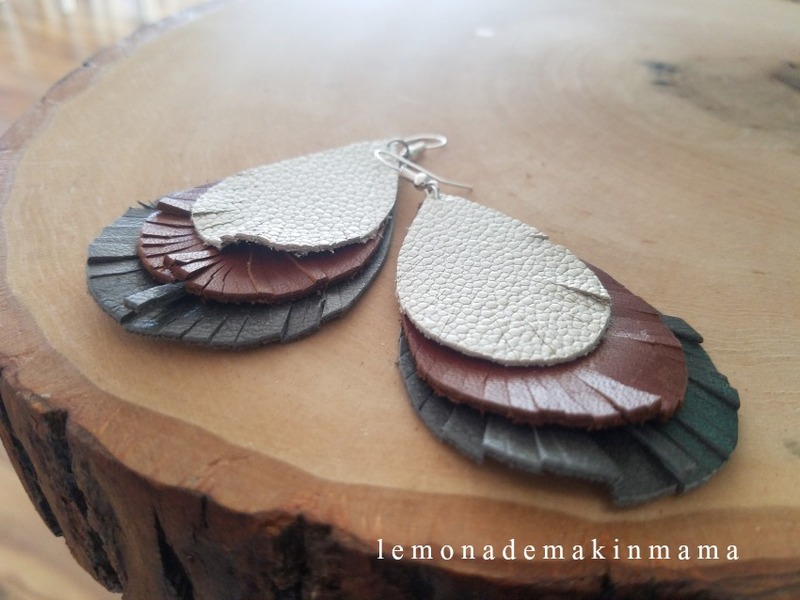 I love them because they are light statement earrings. I'm just as excited about fall as the next person, (if not more) but I'm working on being here, now, and being thankful in this here and now. I crave peace alongside appropriately timed anticipation, like it was when we were kids. We vaguely knew fall was coming, and with it, Halloween candy, pumpkins, thanksgiving and such, but were still busy playing hard outside while the days were warm. Life is hurtling forward on me, and I find myself digging my heels in a bit to slow the passage of time so I can anticipate it and savor it a bit more. Losing my daddy slowly, day by day to Alzheimer's and having teens so close to flying the nest sure makes me appreciate this very moment a lot more. Love the wreath, your office, game schedule, and home. 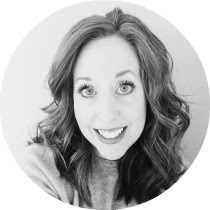 So nice to hear a blogger encourage us to enjoy and be thankful for the now. I started reading blogs a few years ago and am thankful for their ideas and beautiful home decor pictures, but found myself decorating way too early for seasons and holidays, and, actually, decided this school year, I would go back to my old way of holding off longer and enjoying the current season. I'm an organizer, clean house maker, and simple is best decor gal, and I don't enjoy doing it any other way. You're a good influence on your readers. I appreciate that. Thanks for sharing Sasha. Your earrings are super cute and I love the Julia Child quote. Being in the here and now is definitely to be savored. It's good to have a vision but we are not promised tomorrow. That said I am looking forward to those recipes! Happy Labor Day! I think this is great advice, to not let ourselves get caught up with what is next and just actually BE in the here and now. I find staying away from big department stores (as much as possible) helps with this! I don't need companies enticing me with stuff to buy for the next season or event...and it's much easier to put it out of mind if I don't have it in my face daily! I have said it before, but KUDOS to you for making...and finishing that wreath. It beat me. I gave up. Gorgeous, though....as are the earrings. I think I could handle them! Loved when my older two kiddos were in the same school and same schedule. Made life so much less chaotic. I am waiting for fall temps here as well....Soups...be still my heart!